Evelyn D. Harrison's photo of a Gila woodpecker appears in the Arizona Highways Wildlife Guide. More than 100 of the animals that have appeared on Arizona Highways' pages for decades are on display in a new guidebook. The Arizona Highways Wildlife Guide, which is now on sale on the Arizona Highways website and at select booksellers around Arizona, features 125 of the animals, from pronghorns and peccaries to Gila monsters and humpback chubs, that call the state home. It's organized by animal type, with four sections: mammals, birds, reptiles, and amphibians and fish. Wildlife expert Brooke Bessesen wrote the text for the book. Bessesen is a longtime certified veterinary technician for the Phoenix Zoo who also writes scientifically under its auspices. Yvonne Kippenberg's photo of a coyote graces the book's front cover; other photographs were provided by Arizona Highways contributors and by the Arizona Game and Fish Department, which additionally provided special assistance in editing and fact-checking the book. 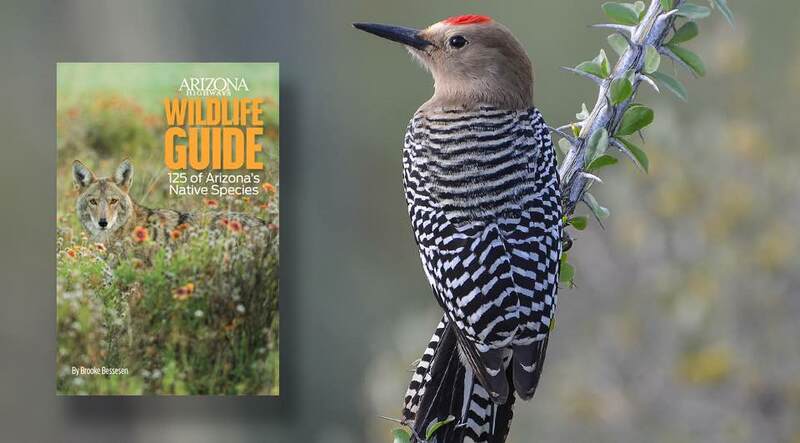 "The wildlife guide is an excellent addition to our collection of guidebooks," says Kelly Vaughn, managing editor and books editor of Arizona Highways. "We’re thrilled to feature some of Arizona’s most interesting native species." The Arizona Highways Wildlife Guide is available at the magazine's online store, www.shoparizonahighways.com, where shoppers can also purchase other guidebooks, coffee-table books, children's books, calendars, holiday cards, décor, jewelry, accessories and more. Arizona Highways, published since 1925, has subscribers in all 50 states and more than 120 countries, and it's regarded around the world as the authority on Arizona travel. In addition to the new Wildlife Guide, the magazine also publishes guidebooks on hiking, camping, fishing and photography. For more information, visit www.arizonahighways.com.